You should never send a generic resume or cover letter! Why? First and foremost, their probability of making it past the ATS is slim to none. To get past the applicant tracking system (ATS), you need to carefully scan the job description to pick out the key words and then implement them throughout. Secondly, generic resumes and cover letters fail to convey your genuine interest in the opportunity. Hiring managers will read them, instantly know it’s the same exact document you sent to dozens of other companies and then set your application into the recycling bin. You would be amazed at how many job seekers send in an application to one company and it’s still addressed to another! It’s a silly mistake that instantly results in your application landing in the recycle pile. Spelling and grammar errors are also too common and easily avoided. Always double check your application for such errors, and consider having a trusted friend be your second set of eyes. Professionalism all around is incredibly important in the job search! Employers have been known to Google their candidates to scope out how they present themselves on social media. Those inappropriate pictures and controversial posts can definitely come back to haunt you! Furthermore, you should look and act the part in interviews – that means a tidy appearance, appropriate attire, avoiding swear words, steering clear of inappropriate conversations and not bashing former employers. Networking can be awkward – it’s made us all uncomfortable at one time! But the fact remains that it’s the best way to find a job. Bite the bullet, join a professional organization, reach out to connections on LinkedIn and attend networking events. You get out what you put into networking! If you think you can skate by the interview without preparing, you are in for a surprise. If you are not prepared for an interview, your hiring manager WILL notice and think you’re not interested in the job. Always check out the company’s website and social media presence, have questions prepared for the interviewer and have clear ideas of what you want to say when responding to questions. Not sending a thank you note or email after an interview is a huge misstep. The interviewer took time out of his/her busy work day to determine if you were the right fit for his/her team. Furthermore, it’s another opportunity to reiterate HOW you’re the right fit and why you should get hired. Every job seeker hits a rut in their search at some point. Sometimes it’s an instance of simple bad luck, but if you have been doing any of these six things, stop and see your luck turn around! 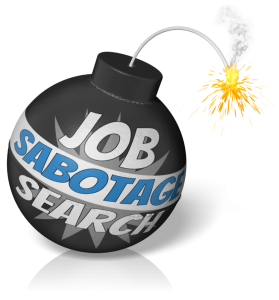 This entry was posted in Job Seekers and tagged Job Search Advice, job search sabotage, Job Seekers, job tips. Bookmark the permalink. When it comes to background checks, Medix does not preclude anyone from applying. However, Medix and our clients perform background verifications as part of their pre-employment process. I hope this clarifies any questions you may have. About the misdemeanor, just be honest and let them know that it is there. Honesty goes a long way my friend. If it still shows up on your record then be up front about it on the application. There is always a possibility that the person you will be interviewing with has a record of misdemeanors, felonies. Best to be honest about anything that might raise flags when it comes to background checks. No need to go into details though, just fill in the blanks, submit the app and see what happens. If admitting to it on your record disqualifies you from a prospective employer, then that’s not a company you want to work for anyway. I would also suggest checking with your local career center and state and city reps office for a list on companies that hire individuals with a record. I am in part lucky, as my last 2 real supervisors I am still in contact with them via Social Media – I asked both of them if I can use them as a reference. One said yes, and the other has not answered yet (suspect she simply has not read her email). You can only do the best you can do. For me, only the last company I worked for is still in business. I have a written review I got at the previous position tho, so that should help. Down side, my ‘boss’ for the last 9 years was the President, and he really didn’t give a hoot about me or the work I did. He just ‘used’ the job for his own uses. (Lawsuits now involved). So I am not comfortable giving him. When I am asked for references I will explain the situation (can google and see the law suits) and that I am not comfortable contacting him due to the active law suite which I am involved in as an employee at the time. Unfortunately I have not gotten to the reference part of an application process yet, Even with Medix. What does one do about references when the supervisor or director of the position that one was employed under is no longer with the company? Great question; I’m afraid I, personally, do not have an answer for you. I recommend calling your local Medix office directly, and speak to a recruiter. He/she will be able to guide you! You can still use a supervisor, manager or director as a reference even if they are with another company because these are people who have direct experience working with you. The fact that they are with another company is something beyond the applicant’s control and doesn’t change the personal experience between the applicant and the reference. i have had multiple jobs that i left in healthcare. I then switched careers totally for a few years. I wanting to go back to my primary career but im having extreme difficulties. please advise. Switching careers is tough, but it’s completely worth it once you find the right position, and you feel fulfilled! My best advice is to not give up; your perfect opportunity is out there. Additionally, please fill out our contact form with your name, location and the types of jobs you’re currently looking for. I will gladly then pass it along to a recruiter who can hopefully help you even more! My boss left so there is no one at my last job to give me a great reference except co-workers I did indeed work with. Is this a good thing? If it was me, I would thoroughly explain the situation to my recruiter/hiring manager. I would then pass along my references, along with the contact information for my former boss (even though he/she is elsewhere) and my former co-workers. If you’re upfront and honest about situations like this, recruiters/hiring managers are typically pretty understanding! Thank you very much for the information on submitting a resume and cover letter, it has been most helpful and I appreciate the feedback. …. You’re so welcome! I invite you to click through our blog for additional advice, and should you have questions, please don’t hesitate to leave a comment. Jay – in regard to your misdemeanor question, certain states have enacted a “Ban the Box” law where companies cannot ask for this information until after the interview process (i.e. offer stage). Also, the screening process must be relavent to the job responsibilities (i.e. government, child care, etc.) and must be provided to the candidate if a decision was based off of it (check the box indicating you would like to receive a copy of the report). Hope this helps! What if you are prevented to attend events to notate as stated into your LinkedIn site, what are your options? Would you mind clarifying your question a little more? If you are referencing networking events, a good second option is to focus on social media networking. I have found Twitter and LinkedIn to be very effective in meeting other professionals, sharing ideas and eventually building connections. I have done my very best to avoid making all of these mistakes. I am surprised that bad references was not on the list. A recruiter will tell you they’re going to format your resume and send it over to the client. Before that happens, don’t they need to check out the persons references listed? One negative comment could also sabotage your developing relationship with your new staffing agency, is that correct? I’m just trying to understand what else would cause someone to just not call back? A recruiter specifically. And it wouldn’t hurt to say, “Well, this client or we have decided not to work with you.” And why? That’s all. I feel like they’re just here to take all of my information and never call back???? References are tricky, as some employers put more focus on them than others. Would you mind filling out our contact form with your name, location, positions you’ve been applying to and a little more information about your situation? I would like to see if I can help you. Glad you found the post and the comments helpful! I hope you have a great weekend! Hello, I admit I do have an issue with the generic resume and cover letter when applying to positions. My question is when applying to positions and you are sending them a copy of your resume, what are some ways or examples that you can change it up from employer to employer without completely taking away from your original format or template resume? Second, I usually will send a general cover letter to the potential employer, but when it comes to the position I specifically apply their name or position I am applying for in the cover letter, what are some ways or examples that I could use to change it up quickly, but not giving away too much of myself, because I feel when you do this, if you get the interview they will know just about everything, and you will have nothing to expound on. Lastly, I have a language disorder I am a paralegal by trade I have not worked as a paralegal, just doing back office work, although there is no medical cure, what are some ways that that I would overcome this when applying for positions in my field? For example, if I am not understanding what is being asked of me, what is a right way for me to ask for them to reiterate what they want from me without a generic would you please explain that again? This may make me look like I am incompetent and unprofessional when people are mean. I appreciate any feedback Thank you in advance. First, for your resume, the best thing you can do is carefully read the job description to determine the skills/experience most relevant to the opportunity. Then I recommend editing your resume to touch on your skills/experience that best aligns to what they are looking for. For example, if the job description lists a main responsibility as maintaining budgets for a project, I would edit my resume to include instances in previous positions when I successfully handled budgets. Secondly, a cover letter is a great opportunity to tell your professional story, express your sincere interest and explain why you are the very best candidate for that position. I recommend reading about the company online, studying the job description and then taking cues from both, similarly to what you would do for your resume. For your last question, I recommend being open and honest about your language disorder. This will help your supervisors and coworkers learn and understand how to communicate with you better. Hope this helps! Please respond back if you have follow-up questions! Thanks! You are right; having the skills, experience and aptitudes to do the job is a hugely important factor! However, these missteps highlighted in the blog post can serve as a distraction or prevent a candidate’s awesome skills and experience from being seen. I was fired from a job after being there for 3 months. Honestly, my supervisor was not a good trainer. Since this job, I’ve gone on to two other jobs and had good success . I’m now working with a recruiter from a big staffing company. The recruiter advised me to remove the 3 month position because by adding it, it blemishes an otherwise great resume (her words). I had a recent phone interview. The interviewer was impressed with me until I admitted that I was fired. At that point the interview ended. What’s your opinion of admitting being fired…admit it or leave the info off of the resume? That’s a tough situation. I always recommend being open and honest. However, if your recruiter is advising you to remove it from your resume, I would listen to his/her recommendation. I would also then ask your recruiter if he/she recommends bringing it up in an interview or not. Recruiters know their clients very, very well, so they typically have great advice for candidates in their clients’ application process. Hope that gives some clarification! I recently had the opportunity to be interviewed for a job opening. Prior to the interview, I thoroughly researched the company, which is a great organization; as well as their requirements of prospective candidates in terms of the position. Unfortunately, I was just informed by the recruiting officer that the employer opted not to bring me onboard. Reasons given by the hiring manager is that “during the interview my posture was too relaxed (i.e. lending back in chair); and that I didn’t seem too enthused in becoming employed with the company. I was completed blind-sided and slightly devastated while listening to the echoes of his voice as he stated the reasons. I’m a fairly intelligent and articulate individual with an easy-going (mild-mannered) demeanor, which tends to sometimes be misconstrued as being un-enthusiastic, or unmotivated. My skills, experience, aptitude, and strong work ethics more than qualify me for the position, to say the least. I was absolutely confident in being hired for the position, so much to the fact that a few days earlier I declined another job offer because of the reservations and interests I had in this particular company. Also during the interview session, I was asked “what would you say is your biggest weakness?” I replied that “I have a tendency to become nervous during job interviews, which you may have already observed.” He assured me that I was doing fine. I honestly believe that this was the ideal company and career defining opportunity for me advance in my craft. What bothers me the most is that at the end of the interview I neglected to ask if there were any concerns regarding my candidacy? Any advice, or suggestions to assist during my future job interviews? Sorry you had that experience! That had to have been really, really rough to go through. Body language is important during interviews. I recommend Googling advice on posture and body language. Typically, it’s recommended that candidates sit up straight, make good eye contact and nod appropriately. This conveys your engagement in the conversation and interest in the position. It’ll feel unnatural if you’re a more relaxed person, but staying cognizant of your stance will serve you well. Furthermore, asking interviewers if they have any reservations on hiring you or if the need clarification on anything to help them make their decision is a great strategy! I actually used that myself in job interviews. It always showed my interest and highlighted an area of my experience hiring managers wanted to learn more about. It’s a little nerve-wracking asking the question, but if it helps dispel any of the hiring manager’s reservations, it’s worth it! All in all, I would recommend reading more interview advice and then practicing your skills with a trusted friend or mentor who will give you genuine feedback. Hope this helps! Best of luck on your search! How does medix conduct reference checks from previous employers do they call or send in a faxed document. I need to know because my previous employer is no longer in practice and i need to figure out a way for the agency to get in contact with them if they dont do phone calls to verify.